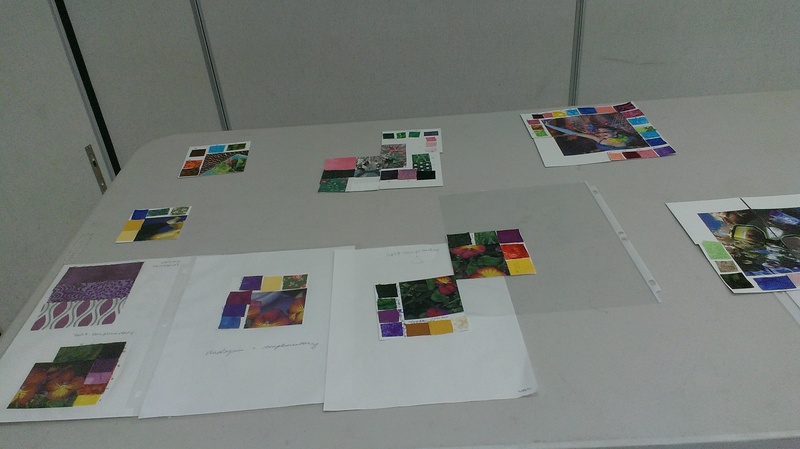 This was a "hands on" colour theory class taught by Cynthia Solomon. Each student was asked to bring 30 two inch strips - all colours & prints ,lights and darks. All of these strips were pooled on to one of the tables and were used by the class in the learning process. Left over strips at the end of the day, and there were many , were donated to comfort quilts. Using the colour wheel we learned the ways in which we could used colour theory to drive our selection of colour as we create our quilts. The course was most helpful and Cynthia made the complicated easy to understand. The attached photograph shows the results of one of the exercises performed. We each were given a photo and asked to pick out the colours used in the photo using our material strips. This showed us which colours predominated and how each of us perceived the colours in the photo. By the end of the class we were able to design our own blocks using the colour theory that we had been taught. The class was very well attended and enjoyable. Many thanks the Workshop Committe for all the work involved & to Cynthia Solomon for teaching the course.